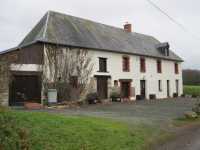 AHIN-SP-001127 Ger 50850 Detached 4 bedroomed house with 15 acres in Normandy and direct access to bridleway. This 4 bedroom house in on the outskirts of a village, within easy walking distance of shops, bars, restaurants, pharmacy, etc. and was built in the 1950's. It would now benefit from modernisation. This detached house benefits from partial double glazing with lovely views over its own land and surrounding fields. It is in a quiet rural hamlet. The house was extended in 2011 to create additional living space. Viewing is highly recommended. 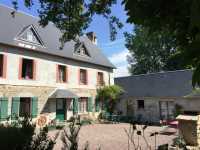 AHIN-SP-001069 Nr Saint Pois 50670 3 bedroom Stone house to finish renovating with super views Normandy - up to 8 acres of adjoining land available by separate negotiation. Recently renovated village house in elevated position within walking distance of shops, schools and a childrens' playground. This beautiful, light and airy, character property has been completely renovated and benefits from electric heating, double glazed windows and a new Spanish slate roof (2007). The property benefits from double glazed windows throughout and is has been re-wired. The accommodation is light and airy. 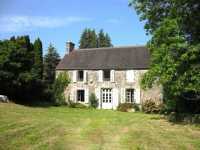 It is situated in a quiet rural hamlet, looking out over its own land and outbuildings. 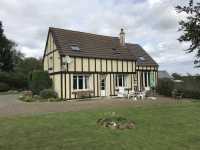 Suprisingly spacious thatched cottage with views over the surrounding Normandy countryside. 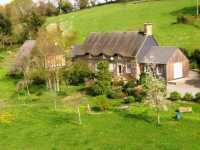 Delightful detached well presented thatched cottage which would be ideal as a holiday cottage or for full time occupation. This attractive property benefits from wood framed double glazed windows and roller shutters. The inset Pellet burner was installed about 8 years ago and is vented to 2 of the bedrooms and the lounge.